New Hope Academy is certified by SEVIS as an I-20 School and is able to accept international students to come to the United States to study at New Hope. International students typically apply to attend high school, though it is possible for younger students to attend New Hope Academy if they have family locally or a host family is available. New Hope is certified by the Maryland State Department of Education as a non-public school. Its classes, credits, and diplomas are recognized and accepted by all other private and public schools, colleges, and universities. New Hope International High School provides a well-rounded college preparatory, liberal arts-style curriculum. Our program is designed to prepare students to be future leaders. We seek to balance traditional preparation for the rigors of college and future careers while also emphasizing the arts and experiential learning. With a strong social consciousness, we work to guide each student to acquire the knowledge needed to fulfill one’s civic duty and promote inter-cultural harmony. Students are encouraged to be globally conscious, with the intention that our graduates will use their skills for the betterment of our larger global community. Laboratory based science courses ensure our students all receive training in the scientific method, focused on hands-on experiments, data collection, laboratory logs, and group work. NHA offers all levels of high school math, up to and including AP Calculus. We test all incoming students to ensure proper placement in the math and English programs. English courses place an emphasis on literature through a guided discussion format, building vocabulary through reading and writing. Students prepare for college by developing the skills necessary to navigate a college course load and to meet the expectations for successfully completing extensive research papers and reports. Students not proficient in English can gain the needed skills through the English Language Intensive Program (see below). 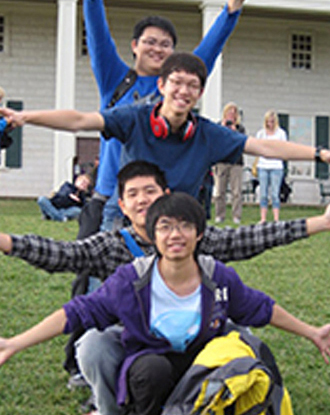 NHA will work to locate a host family for International High School students who do not have personal contacts in Maryland, though this is not guaranteed. New Hope Academy (the umbrella institution for New Hope International High School) is authorized under Federal law to enroll nonimmigrant students. For more information on the Student and Exchange Visitor Program (SEVP) and the Student and Exchange Visitor Information System (SEVIS), please visit their web site (www.ice.gov/sevis).